Thanks to a new production technique, PISTOL is much faster and powerful than traditional short pimpled rubbers, even without the use of speed glue. This short pimpled rubber produces a game with unbelievable dynamics and extremely fast attacking shots, especially for straight hitting and fast looping. You can reach an enormous amount of speed with a short and fast stroke. Moreover the rubber produces a decisive disturbing effect since the ball is very flat and “falls down” while blocking or hitting. 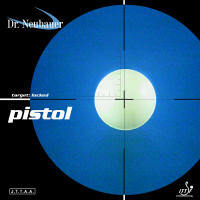 PISTOL also facilitates lifting, producing enough rotation to attack effectively on chopped balls or counter-attacks in order to prepare the decisive shot. With PISTOL you can hit very hard on chopped balls and even on slow topspins, it even enables fast counter-spinning over the table against topspin. Despite its extreme speed PISTOL also offers an astonishing control that provides an optimal feeling at all times for both passive and aggressive strokes.